Here is a link to a Facebook photo album detailing my experience using the non-electric Wonder Wash for the first time. It was relatively quick and easy, and I was able to use only 5 gallons of water, all of which I recaptured to use as gray water for flushing toilets. As you’ll see, I did use the spin cycle of the regular washing machine for about 10 minutes, so I could hang my shirts without distorting them from the weight of the water. (I guess that would be the only water I couldn’t reclaim as gray water.) The only downside to the experience was that the directions that came with the Wonder Wash were unclear and incomplete. I had to go online to find instructions regarding amounts and temperatures of water to use for washing and rinsing, and then had to convert the liters to gallons. Not really a big deal, and it’s easy to remember going forward. A friend wondered about whether soap would be left in the clothes at the end of washing. My clothes are still damp as I write this, so I will post again to let you know how they turned out when dry. This entry was posted in mini challenges and tagged laundry. Bookmark the permalink. Sorry Leonie, I don’t know any locations. I link to an online source in the blog post. 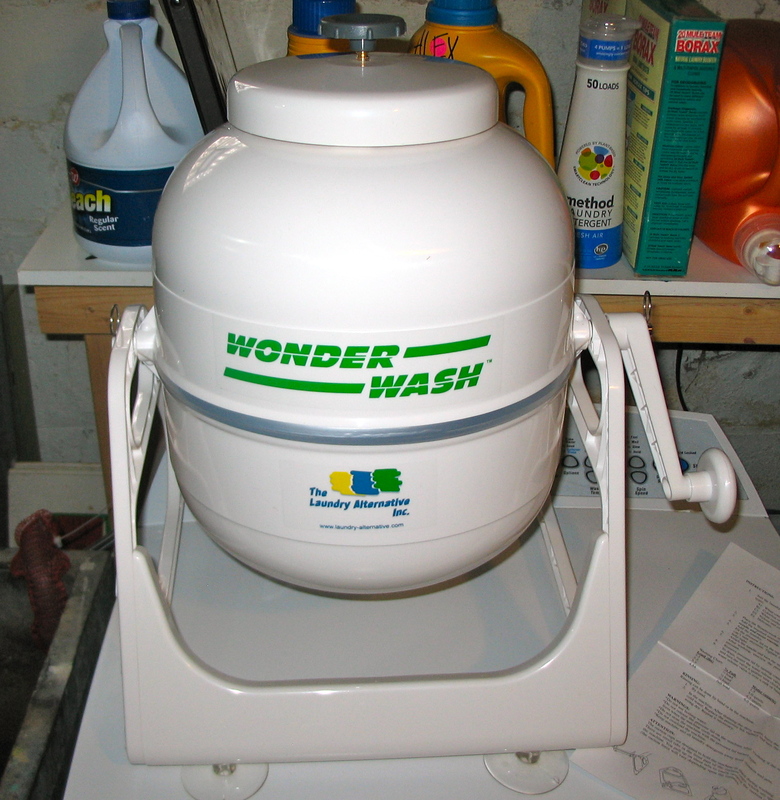 I have been using the Wonder Wash fairly exclusively for almost 4 years now. It works pretty well. My only problem with it is its durability. I have had to replace the stand, handle and repair the cover and crank side of the drum. besides that, my close come out clean and, especially during the winter, hanging my close inside on racks helps with humidity in my apartment. Thanks for the feedback a vote of confidence, despite your problems. Durablity does seem to be a recurring theme with this, and similar products. It would be nice if they offered lower, and higher-end versions. Once I knew it worked as promised, I wouldn’t mind paying more for one that would hold up. After all, throwing away and replacing broken parts is anithetical to thrift and sustainability. Thank you so much for all these photos and the details about this new laundry adventure with the Wonder Wash gadget from Lehmans! Neato bandito. And thanks for all your energy launching this Longfellow group — I’m so glad to be joining in — your blog is fantastic! Thanks, Carolyn. We are having a lot of fun with the blog and with trying new things. Energy comes back 2-fold when you share with others. The group meeting yesterday was GREAT!